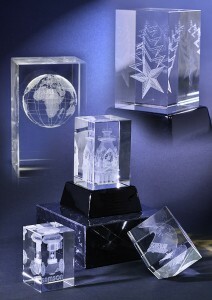 Indianapolis, IN – EMT (asi/52263) has announced laser engraved Crystal Captures blocks as part of their EMT Plus product category. Crystal Captures are the second engraved crystal product EMT has added to their line since introducing Crystal Keytags in 2010. Crystal Captures reproduce 2-dimensional and 3-dimensional images and logos, suspended in elegant blocks of crystal. Optional LED illuminated display bases are also available to highlight the detail of engraved designs.